You will be given a reference e-book to read which has 223 pages And the test will be based on that e-book , you can take final test within 1 year of purchase. Banking economics explains and describes all the trends and operations related to banking within a microeconomic framework by which a resident of a country can easily access. It incorporates practical banking aspects with theory with an aim of setting banking within the paradigm of economics. Knowledge about banking economics will allow anyone to understand not only the microeconomics of banking but also market regulation and structure. One will also gain an understanding on how the different banking trends and operations are analyzed. By increasing your knowledge about banking economics, you get the chance to understand the roles of banking when it comes to shaping up the economic structure of a country. The roles of banking in improving the economy of a country are proven to be really imperative and significant. One of the major functions of banking when it comes to improving the economic structure of a country is to enhance financial stability. Banks are around to lend money to commerce organizations, business institutions and individuals for various purposes. At present, banking is already a major help not only in terms of lending money and providing banking solutions but also in taking care of financial issues such as housing expenses and educational expenses. The role of banks nowadays includes providing mortgages, securities, loans and other useful financial services. With the ability of banking to provide vital financial services to those who need them, it is no longer surprising if it continues to help improve the economic and financial stability of a country. 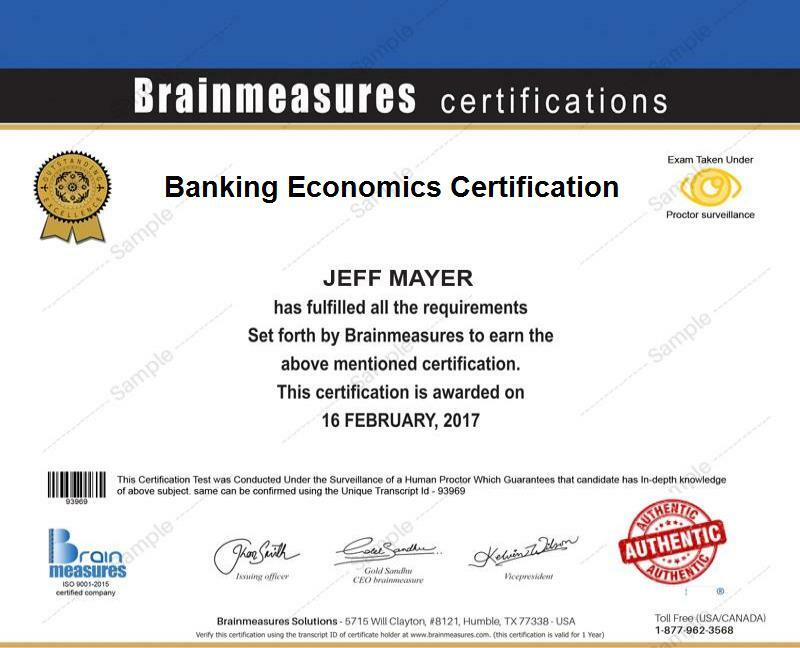 If you are serious about improving your knowledge about banking economics, then know that Brainmeasures, a very reputable and formidable online certification company, can offer you its highly reliable banking economics certification program. This banking economics course from Brainmeasures is guaranteed to help you understand the connection between banking and economics and how the former can help in further stabilizing the economic condition of a country. The banking economics training that you will get from the banking economics certification program offered by Brainmeasures is comprehensive and reliable enough so expect to become a master in this field after completing the program. As soon as you receive your banking economics certificate from Brainmeasures, you can start working in a reputable business organization which requires your services. Anyone who is interested in gaining a full understanding about banking economics can be admitted in the banking economics certification course offered by Brainmeasures. The banking economics certification program offered by Brainmeasures is even more ideal for aspiring and existing bankers, banking analysts and economists who wish to completely understand the relationship between economics and banking. It is also the most ideal certification course for professionals who wish to gain a more comprehensive background about domestic and international banking. Because of the increasing need for banking economics certification holders and experts at present, you will no longer find it hard to find a job with a very attractive pay. An annual salary of around $44,000 to $91,000 is something that you can expect from this field if you are still starting out. If you are already an experienced banking economics certification holder, then your annual salary range will become $83,000 to $142,000.